Stems: Flowering stalks erect, stout, leafless, arising from bulbs .5 to 1.25 inches thick. Leaves: Basal, 2 or more, linear, 4 to 12 inches long, less than 1/4 inch wide, channeled. Inflorescences: Umbels, erect, many-flowered, terminal; subtended by 3 spathe bracts, each conspicuously 3-7 nerved. Flowers: Perianths bell-shaped, on stalks .5 to 1.5 inch long, white or pinkish; perianth segments 6, elliptic-lanceolate; tips blunt or pointed; withering away from fruits; stamens 6, barely shorter than perianth. Fruits: Capsules, short, rounded; seeds 1-2, shiny, black. Habitat: Prairies and roadsides, often on rocky soils. 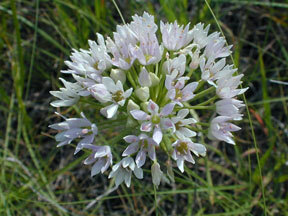 Uses: Native Americans used Allium species as food, consuming the bulbs raw, fried, or cooked in soups. Comments: Allium canadense is highly variable. Four varieties occur in Kansas. In some, the flowers are replaced by bulblets. When grazed, wild onion will give milk an onion or garlic flavor.